The HCE-TCAM1-WRA Rear View Camera and Rear Light System fits 2007-up Jeep Wranglers. It is Alpine engineered for these vehicles and has features that are useful for Jeep owners. 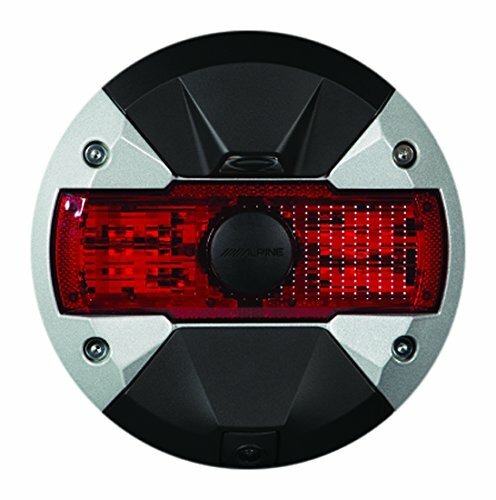 The 3-in-1 design incorporates a rear view camera, LED third brake light, and LED reverse light -- all on a 7-inch round that attaches to the spare tire mount. The third brake light is 2-inches tall and stretches across the middle of the unit. The reverse light is helpful for backing up and illuminates the camera’s viewing angle in low light situations. A removable rubber cap with a debossed Alpine logo covers the wheel lock in the center of the unit. The HCE-TCAM1-WRA’s rear view camera is waterproof and dust proof, so it’s ready for off-road challenges like heavy dust and water crossings. The HCE-TCAM1-WRA attaches to the Wrangler’s spare tire mount and is fixed using the OEM lug nut or an optional aftermarket wheel lock. It is compatible with most factory and aftermarket wheels and comes with three mounting posts of varying lengths, so you can choose a post that fits the depth of your spare wheel. The HCE-TCAM1-WRA projects a color rear view image onto the in-dash screen. Installation is plug-and-play when used with one of Alpine’s three 9-inch Restyle dash systems for the Jeep Wrangler (X109-WRA, X009-WRA, i109-WRA; all sold separately). The HCE-TCAM1-WRA will work with the factory in-dash screen (connection to factory screen requires dealer programming and the Alpine ALP-HRN-CAMCH Camera Input Harness, sold separately) or other aftermarket screen. The HCE-TCAM1-WRA is authorized to be Sold By and Shipped From Amazon. For professional installation, visit the store locator on the Alpine USA website to find an authorized Alpine retailer near you.